Crystal healing is a gentle but powerful therapy, dating back to the ancient Egyptians. The way crystals are formed means that the molecules arrange themselves into very tight and exact patterns, known as 'crystal lattices'. These patterns cause the molecules to vibrate and these vibrations, or tiny electrical impulses, are received and recognised by the body's neurological system. Crystal healing helps to clear energy blockages, the powerful crystals then direct energy and amplify healing. Crystals have the ability clear and heal our energy field around the body, known as the aura. 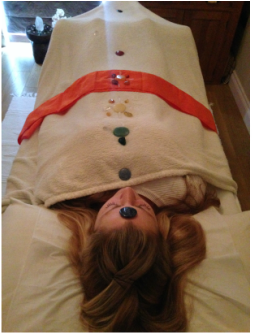 The placement of crystals along the body and at each chakra point, induces a deep relaxation, a release of stress and pain, and also promotes energy and balance within the physical and subtle bodies of the individual. 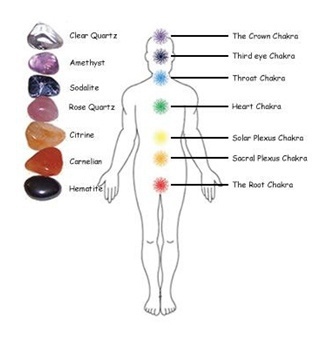 Each crystal holds it's own specific properties, the crystals will be chosen accordingly throughout your treatment to correspond with each chakra and any imbalances. Your crystal therapy treatment will last around 1 hour. There will be a consultation at the beginning and a short medical questionnaire. You will then be asked to lie fully clothed on the treatment couch and I will cover you with a blanket. I then talk you through a short meditation to help you relax. I begin the treatment by using master crystals to scan your auric field . It is thought of as being an outer representation of your mental, emotional, spiritual and physical state, its fluid and changes all the time. Whilst scanning, the crystal will be drawn to imbalances in the aura which are subsequently raised and released using crystals which absorb, direct and diffuse the energy to help re-align and re-balance the aura (this process is carried out a few inches above your body). After the auric scan, crystals will be placed on and around your chakra points. The chakras are linked to our emotional, mental and physical bodies and are known as spinning wheels or vortexes, they receive, process and release energy. Each one is situated in, and connected to, a different part of the body. During this time, you should feel a deep sense of inner calm and total relaxation. Some people feel as if they are wrapped in a warm blanket of energy, you may also feel a floating or tingling sensation. Crystal healing brings light into the aura and stabilises the whole system. People often feel revitalised, with a sense of uplifting and a boost in energy levels, a renewed sense of purpose, calmness and clarity of thoughts. Many people notice a release of old, unwanted emotions, and a relief from aches and pains. The therapy helps alleviate tensions and helps prevent physical illness, supports recovery and releases negative thought patterns, and generally balances body, mind and spirit. A restful sleep is often experienced following the treatment.